Leafy greens, especially dark greens, are a great source of vitamins A, C and K. Vegans and those who are lactose intolerant like that the leafy green family is traditionally a good source of calcium and iron. Packed with fiber, the leafy green vegetable group is a versatile addition to a healthy diet. Mustard greens, collard greens, and kale are all in the greens family. Collard greens, common in the southern United States, are mild and rich in vitamins A, C, K and folate. Mustard greens are a bit more peppery and have the same nutritional qualities as collard greens. Kale is also rich in vitamins A, C and K, although quite bitter. Spinach is a sweet leafy green vegetable, It is rich in vitamins A, C and K. It is also a good source of folate and iron. Spinach can be eaten in a variety of ways, and it is commonly eaten raw in salads or on sandwiches. It can also be steamed or sauteed. Lettuces such as Romaine, curly endive and iceberg lettuce primarily serve as the foundation for salads. The darker the lettuce, the richer it is in nutrients. For example, dark Romaine lettuce contains just 10 calories per one-cup serving and less than 1g of carbohydrates, but it contains 29 percent of the vitamin A, 22 percent of the vitamin C and 71 percent of the vitamin K that the USDA recommends adults consume each day. Arugula is not as common as other greens in the leafy green family, but do not overlook this little gem. It is rich in vitamins A and C, and it is a good source of calcium and fiber. Swiss chard is a green similar in texture to lettuce. 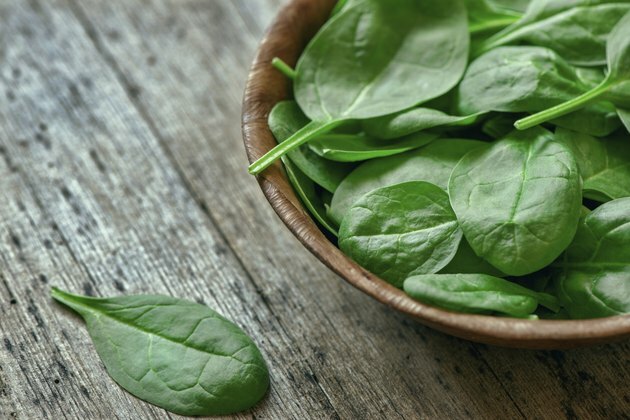 Like its cousins in the leafy green family, it is rich in vitamins A, C and K. However this leafy green powerhouse is also a good source of potassium and iron. Broccoli is closely related to the dark green leafy veggies, and it's part of the cabbage family. It is rich in vitamins A, C and K, and it contains fiber and folate. This versatile green vegetable can be served raw or cooked into stir fries or casseroles. ChooseMyPlate.gov: What Foods are are the Vegetable Group? Are Parsley and Celery the Same?